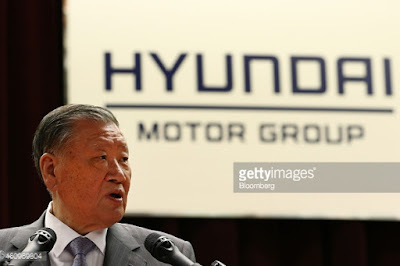 Hyundai Motor Chairman Chung Mong-koo and executives donated a combined 20 billion won ($17.73 million) to a government-initiated fund to run programs for young jobseekers, the carmaker said Sunday. The donation came three days after Samsung Electronics Chairman Lee Kun-hee donated the same amount to the youth employment fund. Leaders of Korea's major companies such as SK, LG and POSCO are expected to follow suit. "The chairman agreed with the idea that concerted efforts are needed to tackle the worsening youth unemployment," Hyundai Motor said in a press release. "We hope our donation will give unemployed young people hope for the future and inspire them to make a creative challenge." The Youth Hope Fund was created in September at the behest of President Park Geun-hye. The fund, which has received roughly 4.3 billion won in less than a month since its launch, will be used mainly to cover the blind spots of the government's youth job policies. Occupational training and mentors will be made available for job seekers, while the tentatively named Youth Hope Academy will analyze the demands of employers and match them with potential employees. The Youth Hope Foundation will also coordinate with private institutes in finding young adults job opportunities overseas. The nation's biggest carmaker plans to hire more than 36,000 people over the next three years. It recently unveiled a startup supporting plan, which the company believes will create 12,000 jobs for young people. Hyundai Motor's affiliates have joined the campaign, collecting independent funds for job creation or expanding employment. Hyundai Motor has run various job creation programs since 2012, in collaboration with the Ministry of Employment and Labor and the Korea Social Enterprise Promotion Agency. "Hyundai Motor will do everything it can to expand youth employment and help those seeking to startup businesses," a company spokesman said. Korea's youth unemployment rate is at its highest level since 2000 ― an estimated 410,000 young adults were unemployed in the first half of this year, up from 330,000 in 2013.